Denise Thompson is a professor at John Jay College of Criminal Justice of the City University of New York. Her research work and publications focus on disaster risk reduction and governance, vulnerability and disaster supply chain and logistics in multi-state systems in the Caribbean and Sub-Saharan Africa. In addition to her research work Denise Thompson teaches classes in public policy, organization theory and emergency management and works to develop curricula and program improvement initiatives to improve student learning outcomes in these areas. 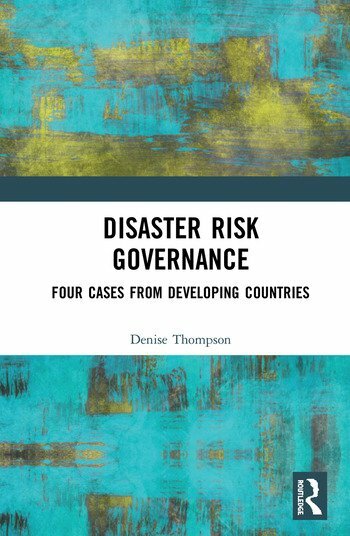 "In Risk Governance: Four Cases from Developing Countries Professor Thompson seeks to focus the radar on a seldom discussed and analyzed subject in Disaster Risk Management. Through the cases it explores another window for analyzing the relationship between the policies and politics of disaster risk management and the outcomes of hazard impacts." — Jeremy Colllymore, Honorary Research Fellow, Institute for Sustainable Development, University of the West Indies.